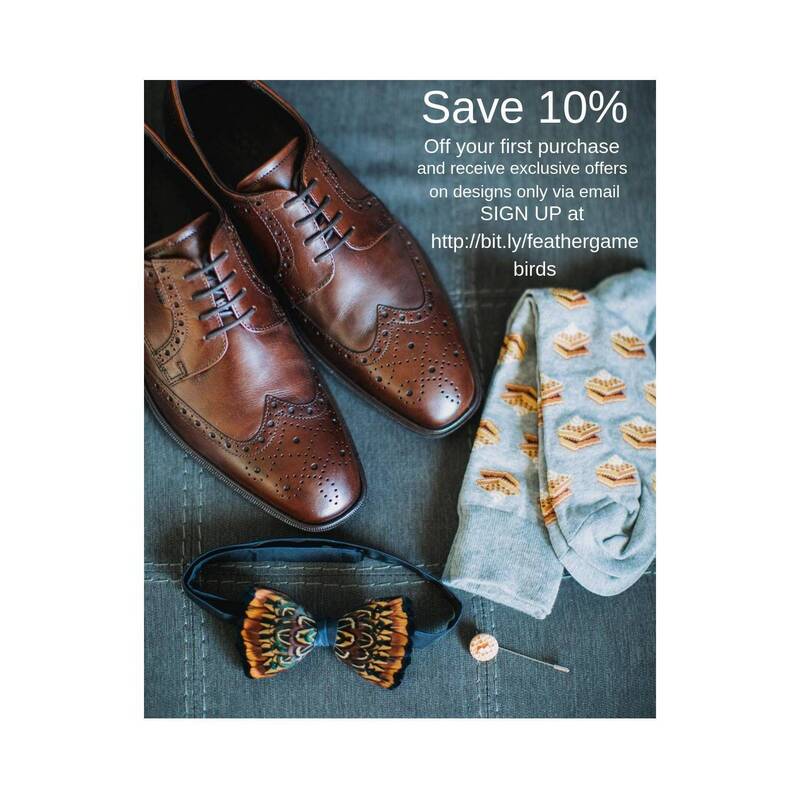 The Original English Feather Bow Tie Company - Each piece is a sustainable, original and wearable work of art. Love is in the detail. 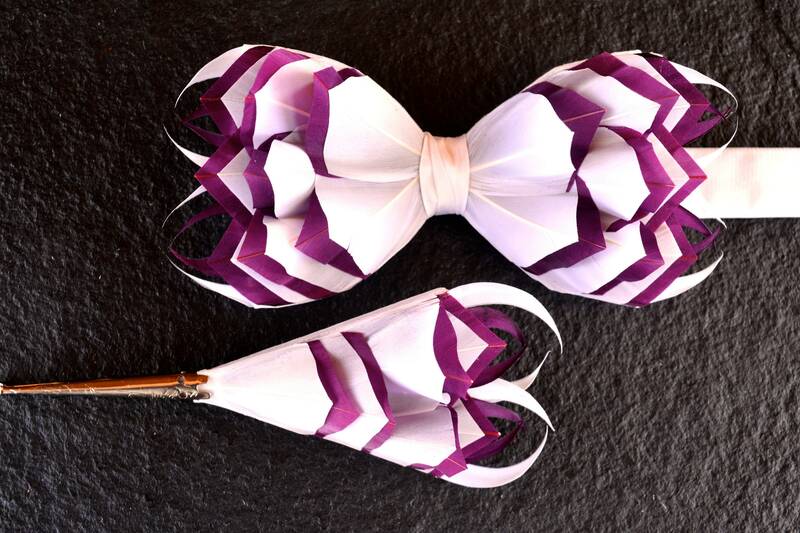 Plum Picasso: The perfect name for this lush, fruity, plum and white contemporary high design feather bow tie and lapel pin set by plumassier artist Tracey Telford. Part of the Haute Couture range, each hand curled and individually placed feather is so deep and luxurious it appears as though velvet to both the eye and touch. This design delivers a ‘spiked edginess’ that stands proud and will leave you doing the same. 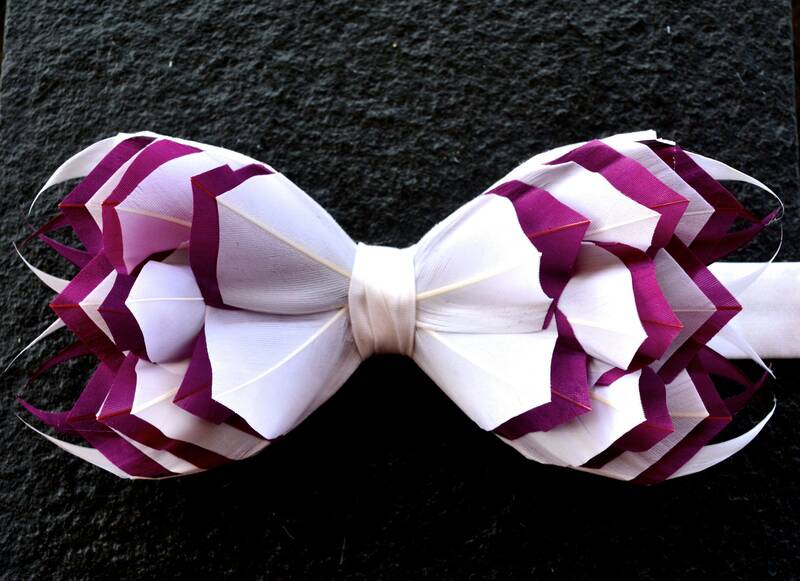 Taking twice the amount of time to make than the single colour 3D bow ties, and set on a quality white 100% silk base, this Plum design is the definition of ‘highly desirable’. Being individually handmade, you can request other layered feather colour combinations and a range of others base colours can also be selected to complement your preferred design aesthetic. It can also be made available on a quality satin. The metal base of the lapel pin is available in a choice of either silver, traditional gold colour or very modern metallic rose gold colour. Arriving in a beautiful wooden roll top keepsake box, which can be personalised with engraving, this bow tie and lapel pin set is also ideal as the perfect gift to mark any special occasion. Complementing designs of feather pockets, wrist corsages, hair clips, bridal bouquets, and fascinators are also available for group events, bridal parties and collectors alike. If you cannot see your preferred item listed in store, you can select the custom order button, or contact Tracey direct, to discuss a more bespoke design. The lapel pins are backed in quality silk to match the base of your bow tie and fasten with two locking pins. You can choose from a silver or gold base pin from the drop down menu. Archival museum treatments are applied to both our fabrics and feathers. They are UV light fade protected, stain proofed and waterproofed to a strong level to prevent ruffling retaining the natural look and feel of the feathers. 1. Choose the quantity that you would like and press add to cart. 2. In the notes sections at checkout tell us the date that you need the item to ensure we prioritise your order. 3. Wish to add a personalised message to keepsake boxes use the dropdown menu, and then during checkout provide your personalisation EXACTLY as you want it to be spelled in the “Note to Seller” section. If you forget, just send me a message on Etsy after your order is completed. You can add initials, names, dates, and a few lines of a poem, a special message or phrase. Use the custom order button to talk with our designer about your ideas. We specialise in custom orders for Red Carpet Events, Film & TV and Weddings. Processing time is 1-3 business days. If you need it sooner please add a note at checkout so that we can prioritise your order. I accept all major credit and debit cards and Paypal. 1) During checkout, select the Paypal option and select "checkout with paypal"
2) Instead of choosing to pay with your PayPal account, select the option to pay with a debit or credit card. 3) You will then be prompted to fill in your billing and credit card information. 4) You will need to enter your email address so PayPal can send you a receipt. 5) Click Continue to return to Etsy Checkout to review and submit your final order. 1. I will send you a note that I have received your order within 24 hours of purchase. 2. Your item will be shipped within the time specified on the individual listing, unless otherwise notified as they are handmade to order, unless already available in stock, allowances for public holidays need to be made. 3. All items are shipped via Royal Mail UK Postal Service unless otherwise requested. Upgrades are available upon request; use the contact me button to make enquiries for this. For U.S. customers they are shipped to U.S.P.S. Provision of a contact telephone number in our experience is useful to add to the parcel to streamline delivery on occasions (your data is never shared with other parties). 4. I will happily ship straight to a third party as a gift for you, as well as include a personal note as requested, just leave me the information in the "note to seller" at checkout. 1. Domestic delivery within the U.K. - first class 1-2 business days, expedited can be requested as an upgrade, please contact us to ensure the item is ready to post. 2. For delivery to the U.S. from the U.K. while packages generally arrive in the U.S. in 5 business working days, please allow up to 2 weeks for International deliveries at busy times before requesting a refund for lost mail or non-delivery. Whilst normally very reliable services both the postal service and customs can experience problems occasionally and thank you for your understanding. To date we have never had a parcel go missing using these methods, or be unduly delayed in the process. For expedited rush delivery via UPS please contact for upgrade information. 3. EU - delivery 3-5 business days, though outlying areas can take longer. Expedited service via UPS is available upon request. 4. Rest of the World - as per U.S. without USPS comments. Please remember that shipping around any holiday period can be unpredictable and priority upgrades are recommended to ensure faster delivery times. IMPORTANT NOTE: International buyers are responsible for ANY and ALL customs charges, taxes and additional postage fees, this includes any fees incurred if the parcel is returned to the seller undelivered due to an incorrect address or other reason not the fault of the seller. Bow Ties and Lapel Pins are packaged in a beautiful wooden roll top keepsake box (you can request engraving, names, dates, messages). They are packaged then into a bubble wrap which is placed inside a double wall super strength cardboard box to keep them safe from damage that may occur in transit. 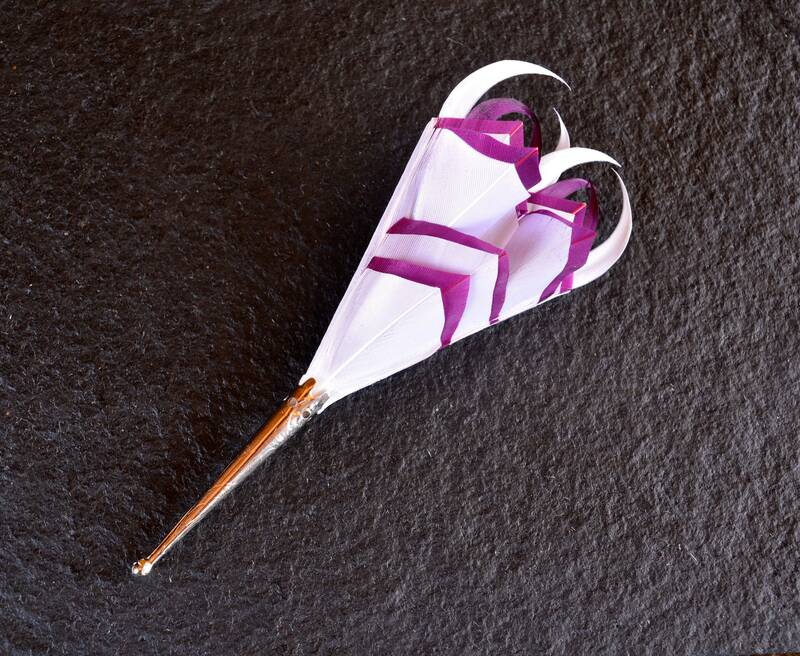 Fascinators, hats and flower pins also have suitable protective sturdy boxes and additional outer wrapping. All of my items are handmade in the UK, from the Accessory bases and the packaging. In a hurry? please send me a message (convo) on Etsy before you buy, contact us button. I have a quick turn around generally, but do get large orders particularly as we specialise in Weddings, Red carpet events, and Film & TV and our items are popular with Collectors worldwide. I want to ensure I meet your needs before accepting an expedited order, which is why you won't find it as an option without requesting it. For U.S. and International Orders all parcels will be tracked and you will be provided with a tracking number to enable you to see exactly where the last record is at any one time for your awaited delivery. If you need help with your tracking please ask. Domestic U.K. delivery, unless it is a specifically large order I don't send the item tracked or signed for however you can request this service if you prefer. Next day guaranteed delivery by 1pm the following day is potentially available upon request as an upgrade. IMPORTANT - CONDITIONS OF RETURN - Buyers are responsible for return shipping costs, including any levied import duty and VAT. If the item is not returned in its original condition, the buyer is responsible for any loss in value. If making an international return, mark it as a returned merchandise, DO NOT mark it as a sale, merchandise or gift, or it will incur expensive customs charges & we will not accept the parcel, so it will be returned to you & you will incur further costs. Returns must be in original gift box packaging. Customer service is absolutely PARAMOUNT to us. If you are unhappy with your order, or part of your order, or any damage has occurred to your item in transit, please don't hesitate to convo me on Etsy, or e-mail highbirdshootinglimited at hotmail.co.uk, as soon as possible and we will work out a solution as fast as we physically can for you. Please ensure that you check the address you have provided carefully. If you provide an incorrect address the parcel will be returned to us, however for international parcels it could incur returns fees and we will not be responsible for return fees or re-posting costs if the address provided originally was incorrect. After purchase is completed, I will contact you within 24 hours using the convo on Etsy to discuss your ideas. I will work with you on any revisions until you are happy with your custom order. A standard quote includes two revisions. I will send you photographs of products as we develop the designs together. If more than two revisions are required you will receive an amended quotation. Please make any deadline dates clear allowing for posting times from the UK. Do bear in mind that all computer monitors show colours so the finished item may vary slightly from the colour you see on your screen. I try my best to represent the colors as accurately as possible, I photograph them in natural daylight and don't enhance colours or brightness. If you have any questions or concerns about colors, I’m more than happy to answer any of your questions. Any queries about the custom process just contact me. Q - Can I order a design you have with different colors than the options you have? A - Yes you can. This would equate to a custom order, so hit the custom button and ask the question to check I have the colours available in feathers that you are looking for. Q- Do you offer larger sizes in your neckties, as the average can be only up to 18". A- Yes, during checkout there is an option to leave a note to seller. Just state the necktie size that you would like it to go up to. Our bow ties are extendable to at least 22" on average and as they are handmade to order can exceed this upon request too. Q - I want to send this as a present, can I send it somewhere else?. A- Yes, I can post items to another address, write the name and address at checkout, plus any message you would like adding to it. We will put in a gift invoice to hide the price. Q - What about care instructions? How do I look after it so it lasts? 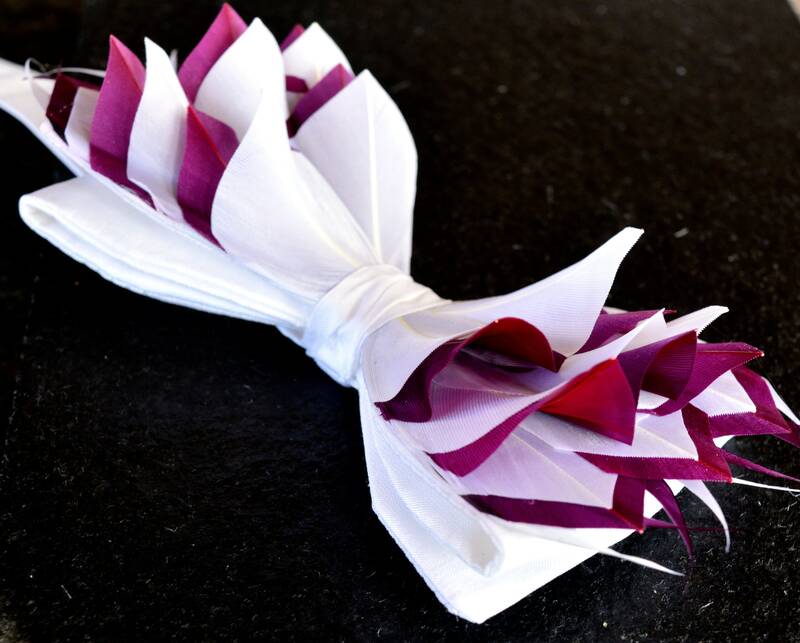 A - I include care instructions in the with gift, simply handle by the centre fabric ring for bow ties, resist the temptation to stroke the very strokable feathers and keep boxed when not in use. Q - Should I have an accident with the item do you offer a repair service. A - Yes we will happily repair an item as long as it doesn't look like the family labrador has retrieved it. Q - Can I wear these bow ties on a daily basis? A - Yes you can, however some feathers are strong and more resilient than others, so contact me for advice on which ones suit that purpose more than others. For example guinea fowl is a resilient feather whilst Woodcock is the most delicate. Q - Do you sell wholesale? A - I will consider wholesale, depending on workloads and offers, convo for information. We take data security and the safety of our customer information very seriously and in line with upcoming legislation, we only wish to contact you with relevant and requested information. We do love to keep in touch with regular updates of new lines, SALE, offers and invites to upcoming events and pop up shops. Maybe you could you take a minute to update us on your preferences. When you purchase a product, your name and email address will be stored online, in our Paypal account for accounting purposes only. Paypal is fully GDPR compliant, and be assured that your details are safe. We will only ever use your contact details for the purpose you provided them for, or to offer you very occasional discount on future purchases as a valued customer. Any paper copies of your details are retained securely in our business premises only accounting purposes & will be destroyed after 7 years. Your details will be held securely online, within Paypal, however they will not be used for any other reason, and we would never share your contact details without your express consent. Option 1 - Please keep me updated with news, events in my area, SALE, seasonal updates and promotions. We will work with you on revisions until you are happy with your custom order as follows:- two revisions are included in your original quotation, so it helps if you have a clear idea on your colour scheme and design preferences. Look through the sales section on our shop to see what is possible before placing your custom order request. Further revisions will potentially be billed at £5 each revision due to the time it takes. All computer monitors show colours differently, also natural feathers vary slightly in colour from bird to bird. To buy in additional feathers for your custom order, the cost will be bourne by the customer and I will agree this in advance with you before ordering, so you can monitor costs to help budgeting. For Sizing Details please see each individual product, as sizes are contained in the description to help you. Items are also shown worn on some products which will give you a better indication of what they look like when worn. Q - Can I wear these bow ties more than once? A - Yes with careful handling our clients frame them following weddings regularly. Q - Do you provide Care Instructions. A - Yes, simply handle the bow ties by the centre fabric ring ONLY and resist the temptation to stroke the feathers and keep boxed when not in use. Q - Do feathers split at the edges a little. 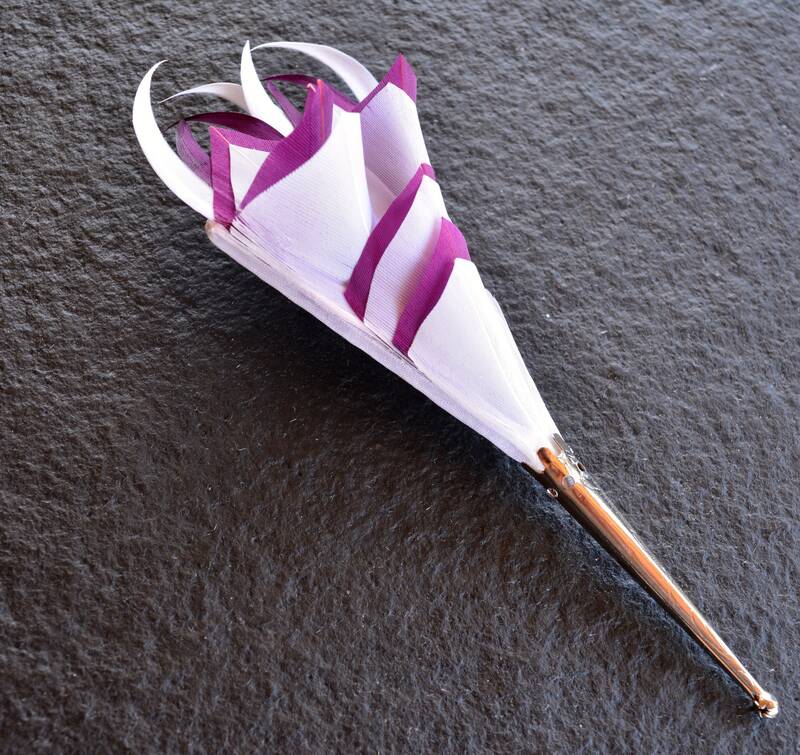 A - Our feathers have archival museum specialist treatments applied that gives them high durability & waterproofing. Should they get knocked accidentally a dab of strong hair lacquer on a finger fixes them back in place. We also offer a repair service if you need it. A- Yes, I can post items to another address, write the name and address at checkout. Q - Can my item be gift wrapped upon request. A - Yes, request on checkout. Feathers are listed as prohibited items in Australia so we are unable to ship to Australia at this time. We also can not ship to Vietnam & Indonesia.